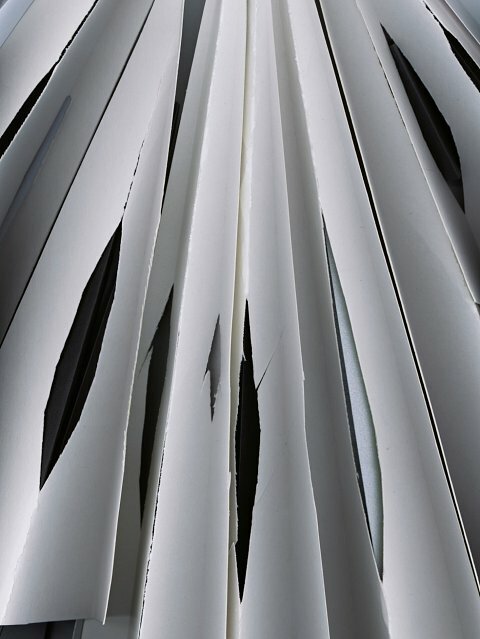 The pieces of paper confronting viewers of the series No-Form-System are folded or torn. In some places the folds are sharp and precise; in others they reveal the destructive process behind their making which, thus magnified, acquires an extraordinary presence. The gaze can follow closely along the torn or folded edges and discern the porous fibres. In combination with their respective structures, the striped segments of different colored pieces of paper make the surface dynamic, while typo- or pictographical fragments appear within the individual motifs. Here the gaze slows down of its own accord and is tempted to decipher the individual fragments – albeit in vain. Their information content remains encoded; the semantic allusions are cryptic and ultimately lead us nowhere. By contrast, the gaze speeds up in apprehending the works that consist entirely of colorful elements.